A few years ago, it seemed that everyone I knew was talking about this British show called Doctor Who. I decided I needed to see what all the fuss was about, and it wasn&apos;t long before I became a fan myself. My kids started watching with me, and it soon became a family obsession. Little did I know that just outside of Indianapolis, in Camby, is the largest retailer of Doctor Who merchandise in the country. Who North America is a unique space that is half Doctor Who store and half Doctor Who museum, with further expansions planned in the future. If you love Doctor Who, you&apos;ll definitely want to make a visit. As we entered Who North America, we were warmly greeted by owner Keith Bradbury. He shared with us that Who North America has operated as an online and fan convention retailer since 1998. They still do lots of online business, but have visitors from all over the country come to the store on a regular basis. Their Hendricks County location makes it easy for travelers coming in from the airport or students at local colleges to make the trip to this Whovian oasis. The first thing that impressed us as we walked in was the sheer volume of Doctor Who merchandise available. Who North America has everything from comic books and collectible figures to kitchen utensils and holiday decorations. My kids added several items to their Christmas lists while we were in the store. Across from the retail side of the store is the museum area, which has been completed since the Hendricks County Insider&apos;s last Who North America feature. 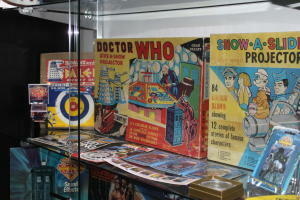 Glass cases feature thousands of Doctor Who collectibles from years past. It has board games, action figures and even hand-made items from the store&apos;s regular customers. Any dedicated fan knows that one of the best parts of fandom is the community. Who North America has become more than a place to shop, but is also a place where fans can gather. The back of the store is home to a classic pinball machine and Star Trek video game that are free to play. The store also hosts cosplay workshops, fan gatherings, and game nights regularly. This year, they even hosted their first Doctoberfest, which will be an annual event! In addition, their new Event Room is now open and available to rent for birthday parties, club meetings and other activities. There are also plans to open a theater room, where fans can gather to watch the show, coming in 2017. This trip to Who North America was our first, but it definitely won&apos;t be our last. If you love this BBC classic, it&apos;s absolutely worth making the trip to Camby -- you&apos;ll feel as though you&apos;ve been transported to a magic world of TARDISes and Daleks. 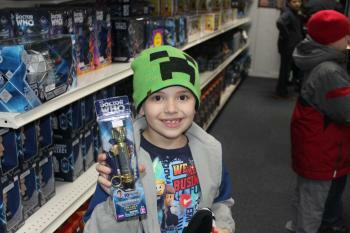 If you are gift shopping for a Doctor Who fan, you won&apos;t go wrong at Who North America. They have literally everything a fan could ever want. Just make sure you ask "Who&apos;s your favorite Doctor?" before you go!